At Zook's Orchard we do not put pesticides, herbicides, or chemicals on our blueberry bushes, wild blackberries, or in our beehives. Your blueberries, blackberries, and honey are ready to enjoy, right from the bush and straight from the beehive. Please note: We do not have public restroom facilities at Zook's Orchard. You pick our natural-grown blueberries. No pesticides or herbicides touch our blueberry bushes or berries. You can eat them right off the bush and we are pretty sure that you will! We are now CLOSED for the 2018 picking season. 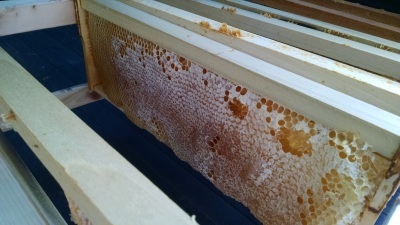 We practice natural beekeeping. No chemicals or medications enter our beehives so there will be nothing but pure raw honey in your jar. We hand process small batches one to two times per season. We also have beeswax taken straight from our chemical-free beehives! We are now sold out of honey. The next honey availability will be early June of 2019 when we open for blueberry picking. We have naturally growing wild blackberries all over Zook's Orchard and they are yours if you are willing to brave the thorny brambles to pick them. We put no pesticides or herbicides on our wild blackberries. Blackberries are now over for the 2018 season. We expect to have a lot of wild blackberries next June.